NOTE: the "Save and go to next" button will take you to the next proof sheet, not the next section of the form. This project includes certified proof sheets of banks in different states, districts, and territories featuring notes of various denominations. To find bank details, start by looking in the center of each note. Using the drop-down menu, please select either “bonds only” or “with bonds and/or other securities.” Find this detail toward the top center of the note, where the text reads “National Currency Secured By Bonds of the United States.” Some notes may read “Secured by United States bonds or other securities” in the top left corner. This is the State, District, or Territory name. Use the commonly known name followed by a comma, then the qualifier spelled out when a district or territory. An example is Territory of Dakota, which can be transcribed as "Dakota, Territory of". The Plate Date is the date written usually near the name of the state, district, or territory. Please format the date as YYYY-MM-DD; for example, Mar. 1 1905 should be written as 1905-03-01. Please help us distinguish which signatures are present on the proof. There are two signatures, near the top center of the note. 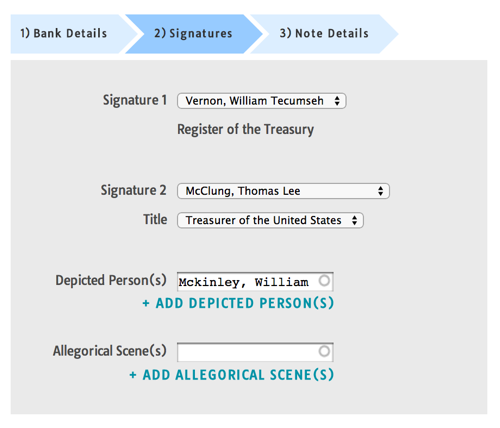 The first signature on the left is the Register of the Treasury. The second signature, which is on the right, will be either the Treasurer of the United States or the Secretary of the Treasury, as indicated under the signature. If you need help distinguishing the signature, you can try this signature gallery: http://www.nationalcurrencyfoundation.com/signaturegallery.html - Hover over the matching signature to discover the bearer’s identity. If there is a person or portrait depicted on the notes, please start typing the last name of that person. The format for this entry should be last name, first name, and middle initial. You can use this list to help you check the depicted person(s) on the notes. For example: Harrison, Benjamin. Please note you may see a reverse image of James Garfield on the $5 bill from the series of 1882. If no depicted person(s) appear, leave this field blank. If there are allegorical scenes depicted on the notes, please enter "Allegorical Scenes" - if no scenes appear, please leave this field blank. These details are found in the borders and edges of the notes and proof sheets, depending on the year of certification. Please follow these instructions closely to determine the information. The charter number is a number engraved into the border of the note; it will usually be four or five digits but may differ. An exception applies to proofs pre-dating January 15, 1878, where the charter number is stamped on the bottom of the proof sheet. In this image, the number is engraved into the border; you would enter: 7718. The series date will be found on the right side of the note. Please format as “Series of YYYY.” These are examples of where the series date may be found. The BEP Certification Date is the day that the Chief/Director of the Bureau of Engraving and Printing certified that the plate was perfect and could be used to print notes. This date is found at the bottom of the proof sheet. Note: this is not the specimen date stamp (the date in a stamp), which sometimes can be found in the middle of the currency proof sheet. Format the certification date as YYYY-MM-DD. 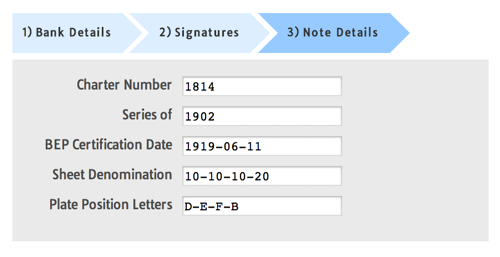 In the example below, you would enter: 1905-06-03. There are typically multiple notes on the certified proof sheet. Please enter the denominations (the dollar amount) of the notes from the top of the sheet to the bottom. Denominations should be separated by a dash. Example: 10-10-10-20. On each of the proofs on the proof sheet, there is a plate position letter – usually on the interior part of the note and frequently near the denomination. In the example above, the Plate Position letter is located on the bottom left interior of the note: A. Please enter the plate position letters from the top of the sheet to the bottom and separate by a dash. Ex: D-E-F-B.